Windy and Max like to work on their tans. Max is having a busy day. Having a diabetic dog means you must be vigilant. If a normal dog vomits or urinates more than usual for a day, typically you don’t have to worry. But if a diabetic dog does, it is a problem. Not happy with being poked at the vet. Yesterday I came home to a lake of pee. Thankfully, I have hardwood floors. I was gone only for five hours, and the piddle pads were history. I suspected Max had a urinary track infection. At the veterinarian this morning his urine showed no problem. The vet took blood, and we are waiting for the result. I needed to run to work, and Max is in my office. Of course he is getting attention and loves every minute of it. I think every day should be Take Your Dog to Work Day. 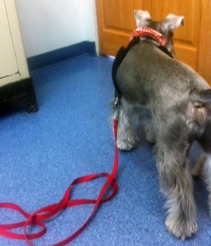 Max is ready to leave the vet’s office without paying. 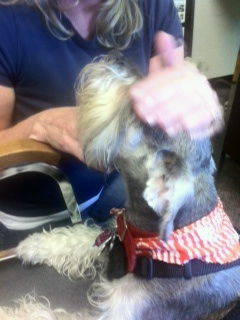 Max gets plenty of attention at his mom’s office. 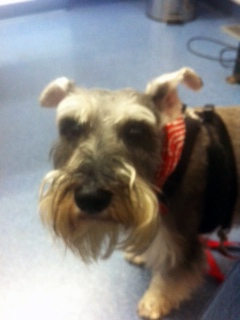 This entry was posted in Diabetes, Dog Health, Schnauzers and tagged Diabetes, Schnauzers. Bookmark the permalink.